Sailors in the "Pineapple Fleet" in Pearl Harbor have a keen sense of history, for many reasons. Besides being homported at the site of the raid that drew America into the Second World War, we're berthed in the shadows of two historic warships, USS ARIZONA and USS MISSOURI, vessels that define the endpoints for America's involvement in that conflict. In addition, just about every deployment brings a tour of the legendary sites of the largest naval war in history. And for RUSSELL, the trip takes on greater significance as the previous USS RUSSELL, DD-414, participated in many of those engagements, earning sixteen battle stars in just three years of war service. On the first leg of our transit to Singapore we passed south of Midway, where, six months to the day after the attack on Pearl Harbor, the Imperial Japanese Navy lost four aircraft carriers and over 200 experienced aviators to a numerically inferior American force. Midway marked the last major push to the east by the IJN and changed the face of naval warfare forever, with the aircraft carrier taking center stage. The next major milestone was Guam, where RUSSELL rounded the northern end of the island and passed within sight of Tinian, the final stop for the Enola Gay and her historic payload on her way to Hiroshima. From Guam the strike force reconstituted and turned to the Southwest, headed fair for the Philippines. 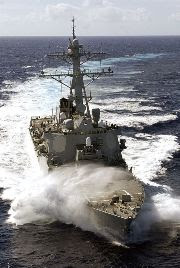 On the way was Leyte Gulf, the location of what is called the largest sea battle in history. On the waters surrounding Leyte over the course of four days 38 aircraft carriers, 21 battleships, 44 cruisers and over 175 destroyers struggled to support or prevent the Allies return to the Philippines. From Leyte Gulf to enter the South China Sea required a transit of the Surigao Strait, the location of one of the major engagements that made up the Battle of Leyte Gulf, and is the site of the last great struggle between battleships. Finally, before entering the Singapore Strait, we passed near the final resting place of HMS PRINCE OF WALES and HMS REPULSE, a site marked to this day by a buoy bearing a Royal Navy ensign. The sinking of PRINCE OF WALES and REPULSE by a force of nothing but aircraft is argued by some to represent not only the deathknell for the battleship, but also the beginning of the sunset of the British Empire in the Far East. The surrender of the last major British garrison in the Far East at Singapore was not far off. Beneath these waters lie the ghosts of our forefathers, and if you listen carefully to the wind on a moonlit night, I swear you can almost hear them calling out, "carry on, Sailor". I'm reading the book "Inferno" right now which is about the USS Franklin (CV-13 I believe). I just finished reading the part about her involvement in the Battle of Leyte Gulf. Great read!